Offering you a complete choice of products which include bucket elevators. 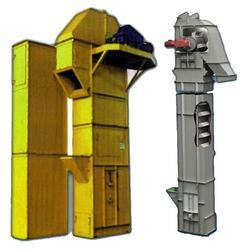 Essar has established a leading position in design and supply of bucket elevators to various industries. 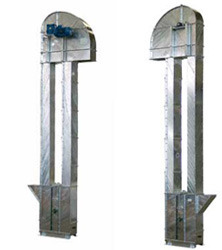 Bucket elevators for mechanical .vertical transportation of materials have become crucial link in production process in many Industrial sectors, elevators supplied by ESSAR are working satisfactorily with more than rated capacity, optimum power consumption. Bucket & Casing sizes are as per Indian standards. Large number of satisfied customers give evidence of fact that ESSAR Elevators are Economical efficient & almost maintenance free. MS. SS & Plastic buckets are offered as required by customer, along with belt/chain are also offered to food & fertilizer & chemical industries. Hold back device to prevent reverse motion of buckets.